I'm back with another Skincandy x 3CE review as promised! Wow I'm at the 5th episode already! If you've read my blog previously, you'll know that I got these from the Carousell Pop-up Market, at close to cost price! Interested? Read till the end to see how you can get your desired 3CE products at low prices too! This time, I'll be reviewing the 3 Concept Eyes Natural Finish Loose Powder and Oil Remover Towel. You can also read about my previous reviews on 3CE products here, here, here and here! First up, the loose powder. I've mentioned on my Instagram that I couldn't find a good loose powder to own. Furthermore, most loose powders in the market are expensive i.e. RM80 and above, which is a lot of money to a student. When I found out that these were going for below RM70 and from a good brand as well, of course I couldn't contain myself! But is it a hit or miss? As usual, 3CE kept it classy and simple with their black, sleek packaging. The instructions at the back are in Korean but after using so many of their products, I find that they are very convenient to use and a quick Google search can reveal photo step-by-step instructions on how to use, as demonstrated by their gorgeous models, so I've never had problems with this! I love that the box is pink inside for a fun, flirtatious feel. The loose powder tub is nicely nestled inside, with the same typography as the box. As usual, watch out for the seal of authentication to make sure that your product has not been tempered with. Audrey only had shade #002 left, which I was afraid will be too dark for my skintone but it turns out, there was no problem at all. #002 is made to suit the natural colour of your skin while #001 is for brightening your complexion. 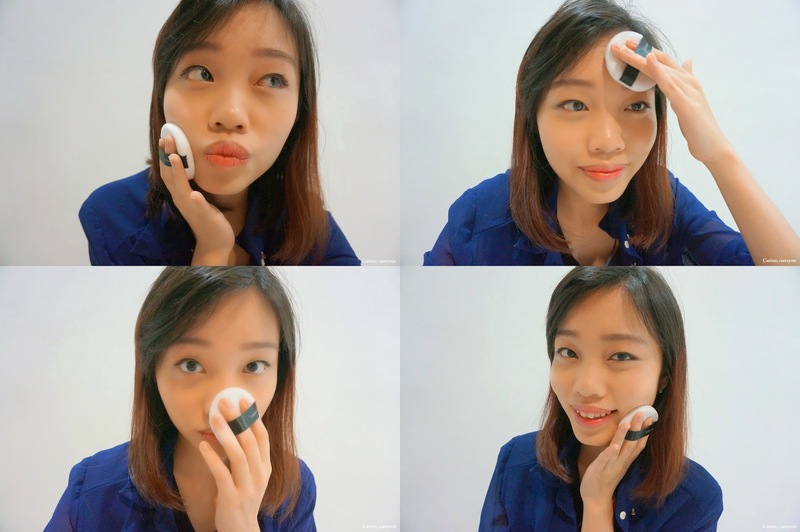 The sponge is a typical makeup pat-on applicator. After removing the protection sticker, you're finally done with unboxing the loose powder and its ready to use! It is advised that you do not remove the sticker after opening, but rather, seal it back in place. This is because the powder contains high water content and placing the puff directly on the powder will cause the moisture content to be soaked up. This will also help to avoid dust from getting into the powder. Check out how fine and soft the powder is! The powder has an unfamiliar scent that is not overpowering because there is no artificial scent added to cover up the smell of the base powder. The powder suits all skin types so there is nothing to worry about. The product has a silky texture when applied and fits the skin closely to create a clean and clear look. It also helps to control sebum and lets you enjoy the fresh feeling while maintaining a long-lasting and soft look. Because of the high water content and micro-particles, the product also helps to hydrate the skin. To use, simply dab or pour some of the product on the applicator. Pat it on your face! From your forehead to oily T-zones, sides of your nose, undereyes... The whole face! This is to achieve an even application. A little goes a long way so go easy on the powder. The before and after photos has obvious results. For one, my skin which was initially oily has been matified! The most obvious part will be my nose area. I personally prefer dewy-skin Korean makeup but the powder coverage is so light, you can acheive that effect too. The loose powder looks cakey at first but will slowly fit your natural skin colour. It's also very lightweight and doesn't feel like your pores are clogged up. It really controls oil secretion and helps my makeup last longer. It really doesn't budge! Also, the applicator is sooo soft and pillowy, like a marshmallow :D It is also hygienic because you have to reseal the protection sticker after each use. The only downside is that it can be quite hard to get the powder out just by dabbing so I tend to tip the tub over and over again to get the product out and it can be quite annoying especially when you're pressed for time. After applying makeup, it is vital that you remove it. If you're feeling lazy, try a makeup remover cloth for size. I got these 3CE Oil Remover Towel at an affordable price too. In fact, I think they're cheaper than the drugstore kind. The packaging is just your regular makeup remover towel pack, but it has managed to maintain the simplicity of the 3CE signature black & white design. After opening the top seal, there will be two marks on the sides which cannot be resealed to protect the originality and freshness of your product. The size of the remover towel is slightly bigger than a tissue paper when unfolded, about the same size as the packet. It looks glossy and doesn't feel too oily to the touch. It feels soft yet is sturdy enough and does not tear easily. There is also a pleasant smell to it. There are 30 sheets in a packet, just enough for a month! Please do not attempt to put back the towel after you've used it, it's so unhygienic if you were to reuse it.. The 3CE Oil Remover Towel has ultra rich hydrating oils such as such as rosehip oil which is rich in vitamin C and avocado oil which is nutritious and moisturising to the skin. It also gives it that natural glow on your skin after you remove your makeup. These high-grade, deep cleansing ingredients helps to wipe out residue thoroughly and make the skin healthy. Pull out the towel gently and wipe off your makeup. Be gentle and cautious around the eye area! HAHA sorry not sorry about the face. One cloth is all it needs to clean off my makeup! Yes, even my lipstick and waterproof mascara! Not only does the makeup remover towel feel gentle to the skin, it is super effective in removing makeup! My eyeliner and waterproof mascara is easily wiped off because of the oils. One thing I kind of dislike is that it leaves an oily feeling on the skin after use. I have dry skin so usually my skin feels dry after removing my makeup. I wouldn't describe it as an annoying stickiness, but rather it feels as if my skin is being nourished. If you're interested in getting either of the products that I reviewed, you HAVE to drop by Skincandyco! Audrey is trying to clear off her inventory so it's your chance now to purchase at lower-than-market prices! Find them on Facebook to check the prices of your fave products. Follow them on Instagram. Tag your purchases with and @skincandyco and hashtag #skincandyco to be entitled to another RM5 off your next purchase! Skincandy will host a new giveaway for every 1K fans. Don't forget, their promo ends THIS weekend, so hurry up and like, share, invite your friends and let them know about the amazing offers NOW! Disclaimer: This is NOT a sponsored review. The review is based on my honest personal thoughts, experiences and preference after getting the products and trying out the service. How I use it may not be the best way for you and effects may vary depending on individual lips/ skin condition and other factors.